Competition motivates some people, maybe a lot of people, but it has never really motivated me. I don’t remember ever really thriving on competition when I was a kid, and I certainly don’t thrive on it now. I was taught to not care what someone else was doing, to concentrate on my own work – so very millennial of me. Nowadays the only person I’m interested in beating is the past version of myself. The only person I want to be is the best version of me. Competition, beyond the friendliest, most innocuous sorts, kills inspiration. 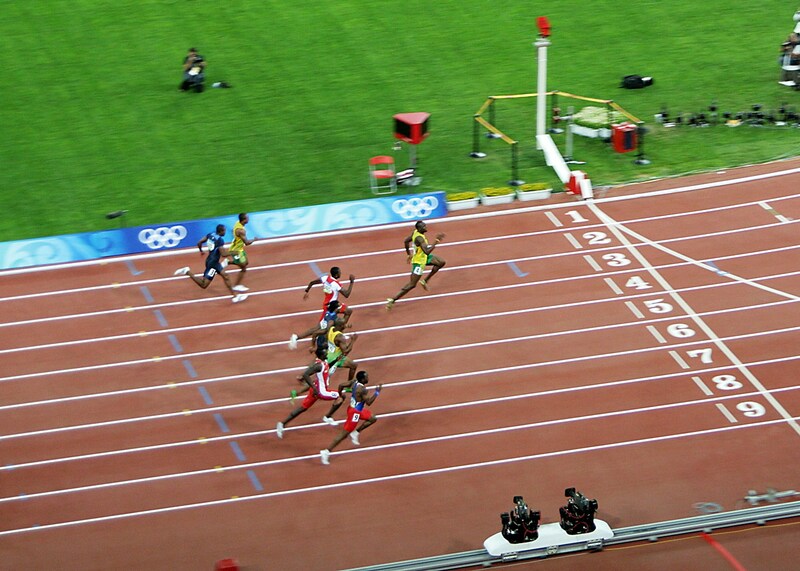 The interesting thing about Usain Bolt isn’t that he beats other runners, it’s that he pushes the boundaries of what we thought the human body was capable of. I wanted to discuss this topic because we often hear some variation of the same thing – there’s someone out there working twice as hard as you, doing X more, doing Y better. Usually you hear this from some guy in sales, or with that same type of temperament. My response: Yes, that may be entirely true, and what’s your point? Do you think by comparing myself to others I’m suddenly going to be motivated to do better? That’s not how it works. And it’s also quite a silly statement on its’ face because there is always going to be someone working harder than you, doing more than you. You have 2 jobs and wake up at 5am everyday? Pssh, that guy down the road is working 3 jobs and wakes up at 4. You worked a 60 hour week? Ha! The woman across the way worked 80 hours and still had time to volunteer. You traveled 3000 total miles to meet with 20 different clients this week? Smells like laziness because the guy two floors above you traveled 6000 miles and met with 40 clients. Haven’t taken a vacation in five years? That’s nice, but Sally over there hasn’t taken a vacation in 20, or ever called in sick. High-five Sally. See how utterly inane this game is? This is just a workaholics version of keeping up with the Joneses. I buy an SUV, you buy a bigger SUV. I buy big house, you build a bigger house. It’s comical, and probably why I’ve avoided sales my whole life. What inspires me is possibility and forward thinking, not sideways thinking about what the person next to me is doing. It’s this natural inclination I have that makes me want to work for companies that emphasize innovation and experimentation – looking forward. I tend to not be interested in businesses that always have me looking sideways at the next guy over. Actually that’s a large part of the reason I became more interested in policy rather than politics. Politics is about gamesmanship and competition, policy is about results and problem solving. Give me the problem solving all day. Of course capitalistic systems are based on competition and there isn’t really anyway around that fact. But I’m not a capitalistic system, I’m just one person that knows what makes me tick and what doesn’t. There is no way for someone to turn on that “capitalistic-gene” within them if they don’t have it. Coming in second never scared me, what scares me is lack of vision and progress. This is partly the reason why I’ve been chasing startup culture instead of corporate culture. But even giant corporations can still maintain the vision a startup has, just look at Silicon Valley which thrives on that culture. Sure, there are Google engineers trying to beat out the competition, same with Facebook and the others. The sales team probably has weekly meetings on how the company is doing compared to their competitors. I know, I get it, no industry is immune. But Google has succeeded because it was always looking ahead, anticipating what was around the bend – hell, creating the bend itself. That is appealing to me, and I think is a common sentiment among people my age. In a Salon piece published this weekend, the writer details his personal struggle with comparing himself to his peers. That idea of looking sideways at other people and trying to measure up was poisonous to his well being. I found myself nodding my head knowingly throughout. I’ll leave you with the last few paragraphs from that piece, because if you’re one of those who finds themselves constantly competing, make sure the competition is yourself. There’s plenty in life I desire and still don’t have. I want to be more accomplished in my career, and have a family, and own property, and win trophies—but I haven’t yet. I could look at people who have these things and compare myself but I try not to do this anymore. It just doesn’t make me feel good. Instead, I look at myself. When I was 25, I was unemployed, poisoning my body and had no real connection to any other living thing. The 30 year-old version of me has found work and academic successes, relationships with other people who trust me and even kept a German Shepherd alive for two years. When I compare me to me, there’s a lot to be proud of and a lot that makes me hopeful for how much better things can get. Nowadays, the competition is firm but very narrow. In every conceivable way, the only person I’m racing is myself. And the possibilities are limitless. I completely agree! When things get too competitive, I actually find that I shut down. Competition doesn’t motivate me, it causes me to back off. Love the quote. As long as we’re bettering ourselves, who cares about the crazy people out there doing twice as much as us? That’s a good way to putting it “backing off.” And it’s not as though I don’t believe competition actually exists. Multiple businesses in the same space are obviously competing with each other, but I just think it’s the wrong way to motivate people. I’m glad there are others who agree!